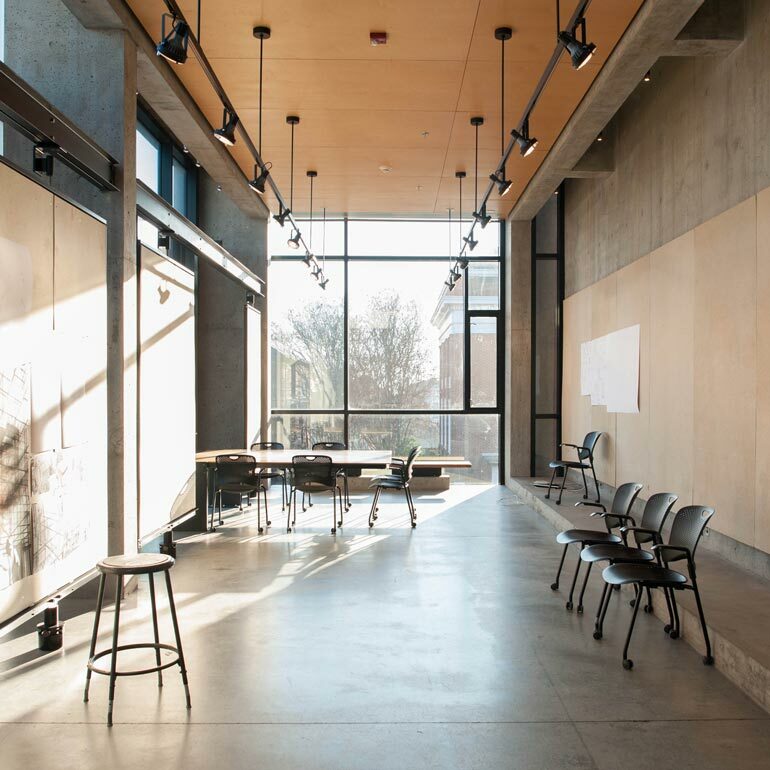 A typical UVA Architecture student spends up to 20 hours a week in the open-plan studio on the third and fourth floors of Campbell Hall. “The studio space is at the core of our design education and curriculum,” says Anselmo Canfora, an associate professor of architecture. There, faculty and students converge on research projects and required studio courses, he says. 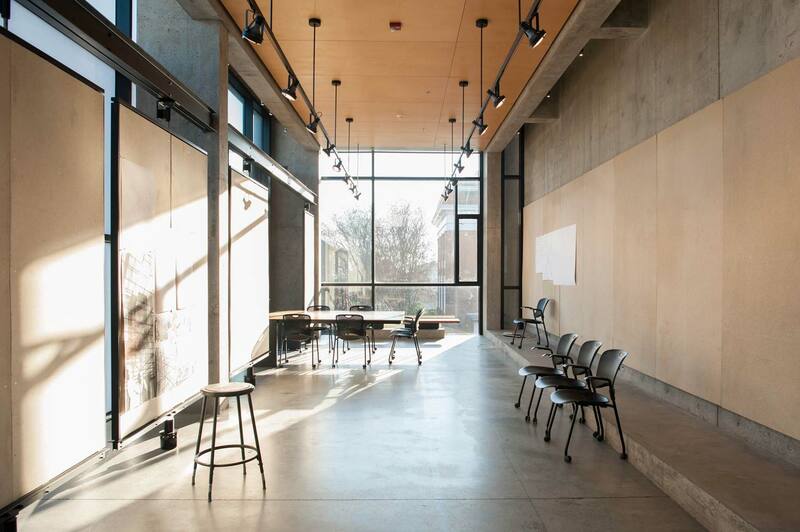 Both undergraduates, starting their second year, and graduate students have “residential desks”—studio workspaces that are assigned to them for a semester. Any student can use “hot desks”—seats at newly installed, long, maple tables in the studio’s east bay—on a first-come, first-served basis. The communal desks are part of Studio Rethink, an ongoing project Canfora leads to make the studio more functional and integrated. Over the next year, Studio Rethink will install new power, lighting and storage systems. “We’re looking at the studio in totality to create an even more flexible, open plan,” Canfora says. One thing that will not change: the buzzing creativity that drives collaborative design work. Take a look inside the A-School studio. Campbell Hall's east addition, completed in 2008. Grad student Anthony Averbeck (Arch '16) walks through the fourth-floor studio space. The third-floor studio space as seen from the fourth floor. Students discuss design work in the studio. A sticker designed by grad students Philip Miller (Arch '16) and Eric Der (Arch '16) aims to represent "togetherness and unity throughout studio." Students survey one another's work in a classroom that will be remodeled in 2017 as part of the Studio Rethink project. The students shown here are preparing for Final Reviews, in which students pin up their work for peer and faculty review, critique and discussion. A student at work in the studio. The fourth-floor plotting room holds large-format printers. A student works at night in the studio. Students at work in the studio. Eric Der (Arch '16) is on the right. Undergraduate Lauren Scott (Arch '16) at her residential desk on the third floor. Students at work in the studio. Students at the public computer space on the fourth floor. Students share a laugh in the studio. Students at the new hot desk space. Students pin up their work at night. Faculty member Lucia Phinney (Arch '79) consults with students as daylight fades. "We spend so much of our time in studio, eating, breathing and (rarely) sleeping architecture," says Eric Der (Arch '16). Graduate student Abigail Figaro (Arch '16) works at her residential desk on the fourth floor. Grad students Eric Der (Arch '16), seated, and Tensae Woldesellasie (Arch '17) discuss design ideas for museums in Washington, D.C.
Clockwise, from back left: Undergraduates Hannah Heile (Arch '16), Ryan Wheless (Arch '16), Yasmine McBride (Arch '16) and Harsheen Kaur (Arch '16) work in the new hot desk space. Students work at night in the studio's east addition, completed in 2008. Grad student Shannon Ruhl (Arch '17) takes a break from designing an environmentally sensitive crematorium in Delhi to cradle a fellow student's cat, Panda. Landscape architecture graduate student Cara Turett (Arch '18) pins her work for the class "Ecotech I" to the wall for peer review. "Ecotech I is a course about the tools and materials of landscape architecture: grading, landform, ground, water. It is where we learn the technical aspects of the discipline and how to use those in design," she says. Undergraduates Melissa Brand (Arch '18) and Zach Winter (Arch '18) carry materials for a studio site model of downtown Lynchburg, Virginia, to the shop to cut down to size. "We were able to get it done an hour before the deadline," Winter says.